Today, Serenity said she had a Valentine for me, and climbed in my lap to give me a kiss. Then I said, “I love my kiss!” And she said, “I have a snuggle too!” and she cuddled up close to me. =) I love my sweet baby girl! She also said, “I love your toes! I love your legs! I love your tummy! I love your mouth! I love your hair! I love your ears! 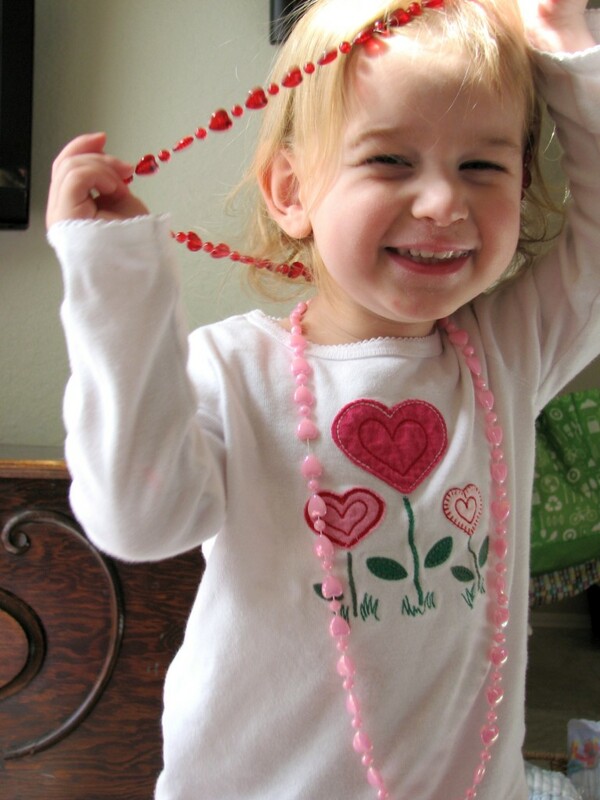 I love your hair!” Then she went upstairs to get her I Love You book, which probably inspired the adorableness. Last night, when we were reading books to go to bed, she actually had Daddy read books, which he hadn’t gotten to do for a while. She pulled out her alphabet books and got the A and the D. Daddy reached for the A, and she said, “no, this one first.” So he read the D. Then they read the A. Then she said, “This one again.” So he read D again. And then she asked for it again. And then she said, now we need the Y, and she got up to look for it. She had him spell Daddy!!!! We were in the car, and Papa said, “Oh, I forgot my driver’s license. I hope I don’t get stopped.” From the back, Serenity pipes up, “Me too! I don’t get stopped either! =) She’s so concerned with red lights. She got a few little Valentine’s day things. 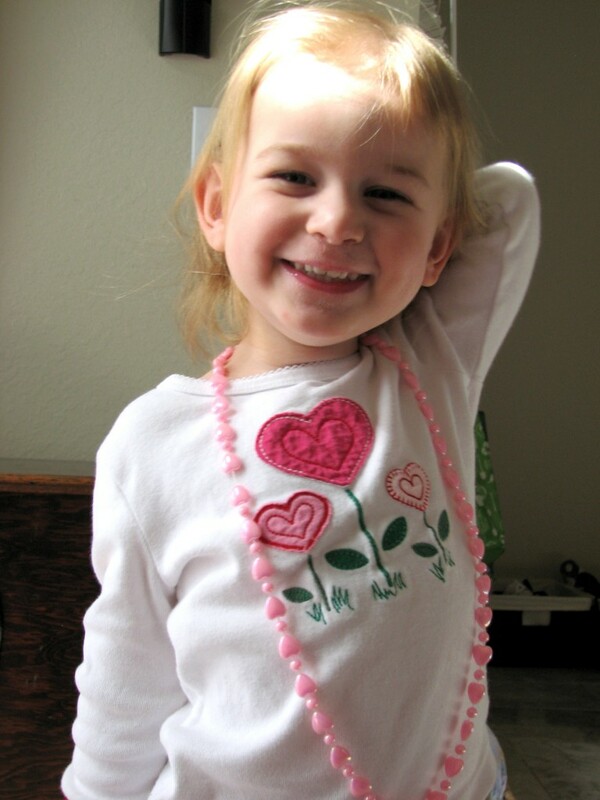 Two heart necklaces, a pink and a red (she wore the pink and Mama wore the red today, as they went with our shirts) She also got some pink sugar (cotton candy first thing in the morning, woo hoo!) and a little heart plate. Today Serenity was playing tea party. She gave me a drink, then ran to the office and gave Daddy three drinks. Then she ran back to me, held the teapot to my stomach, and gave Gonzo three drinks =) With a big smile! When asked what her little brother’s name should be, she has said “A Boy” most often, but has also suggested Zoni and Zobos. We’ve had two days of snow! It’s been fun! Even Eric couldn’t get to work, so we’ve all been snuggled up at home. Serenity is definitely enjoying snow more this year, he can hardly get her to come inside when she’s a popsicle! 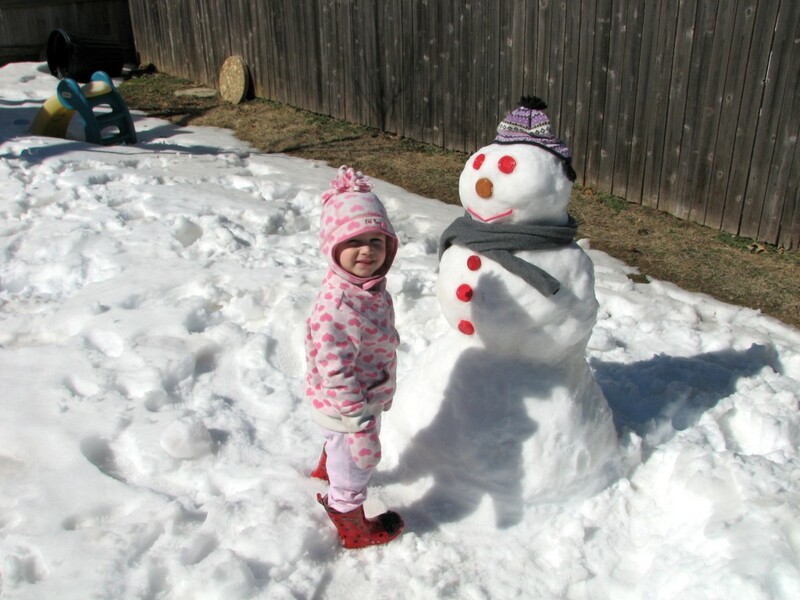 The first day they went in the back yard, and her initial reaction was “Oh NOOOOO! My bike!” In the same tragic little voice she uses for the “Mama rescue me” game. 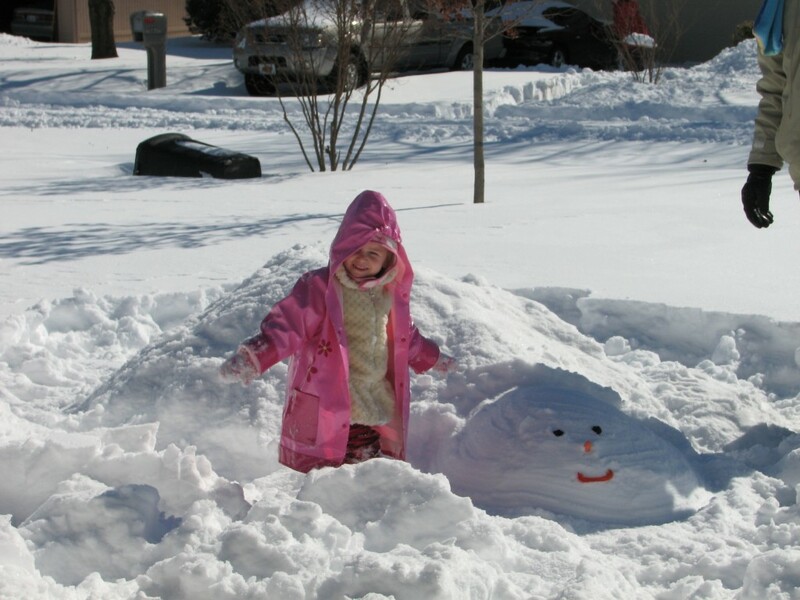 So when she and Daddy went outside, she insisted he dig it out from the snow. And then they did the slide too. 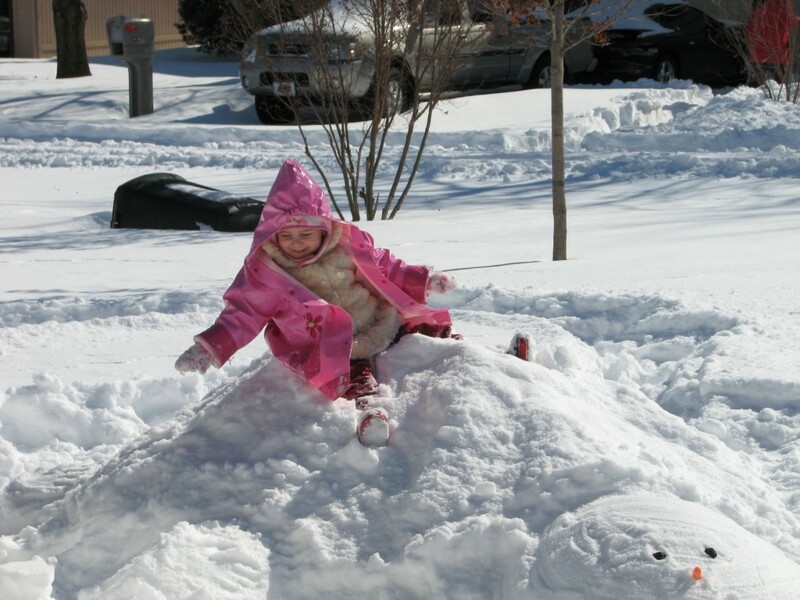 Daddy drew a line however before he cleaned out her playhouse, as it was FULL of snow! They made snow angels and wandered all around! Today they went out the front. It was such a sunny day, we thought maybe it would be warm, but no, it’s 8 degrees. Fahrenheit. So the snow isn’t going anywhere yet. 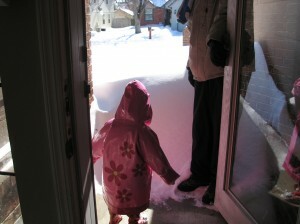 The fun of the front yard was that we had a drift that went up to my chest right outside our door. So Daddy went first and blazed a trail! Serenity loved that so much she asked him to make trails all over the yard, and she followed his path or made her own little trails. She also asked him to make a hill, and when it was done, she said, “It’s a turtle!! !” So they added a head, legs and tail and a cute little face made from a bell pepper, carrot, and two prunes. It’s very cute! Inside the house, the snow day has been good for my to do list. =) We made Valentine Krispie treats and snow ice cream! In the same day. Possibly too much sugar for a snow day, but we enjoyed it. Serenity really helped! She actually measured ingredients and poured them in. She did really well with the dry ingredients, spilled a little milk but it was such fun for her to be working on her stool with me. To make the Valentine Krispies, we just added red food coloring to the marshmallows and then used heart shaped cookie cutters (Thanks Abbey!) to cut out the hearts. It was a nice surprise for Daddy in the middle of his work day! Today we baked banana muffins together, and then I made soup and bread with the bread machine. I spent a lot of the day yesterday cleaning the house, even mopping the floor in the kitchen which doesn’t happen nearly often enough (Who knew snow was good for mopping? =) So at the end of the day I was a little achy, so I tried to get a little yoga in when Serenity and Eric went out for the second time. Here was her reaction when she came in and found me. 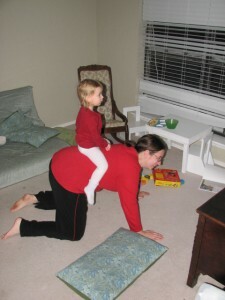 =) Oh yes, Mama must want me to ride on her back! 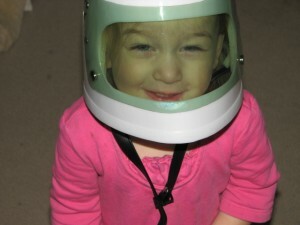 Serenity’s also loving the astronaut helmet she got at Brendan’s birthday! 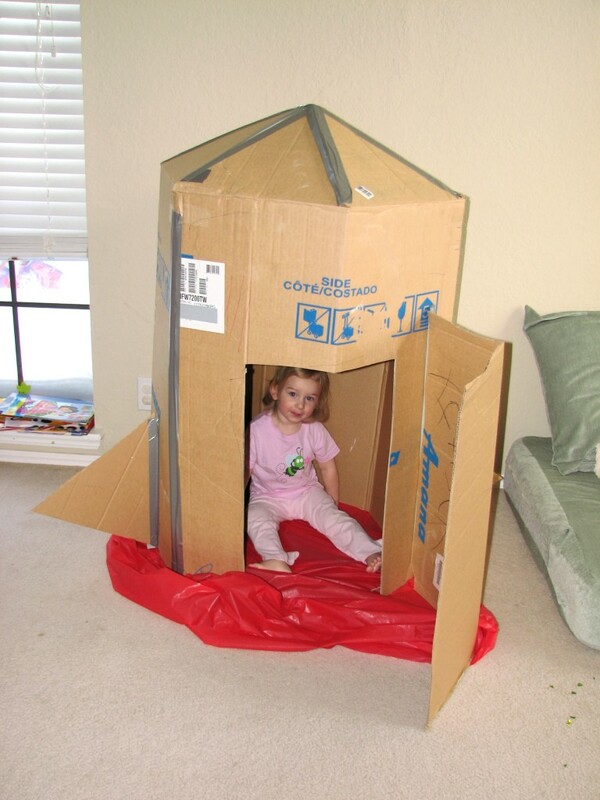 Today, Daddy even helped her blast off in a rocketship after they counted down from ten. 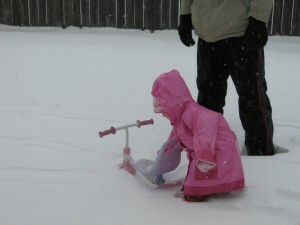 Posted in Uncategorized | Comments Off on Snow Days!